This video recipe produced for About.com is my take on a classic French sauce, the Gastrique. In its most basic form it’s simply a caramelized sugar and vinegar reduction. The modern Gastrique is usually a vinegar reduction combined with some type of fruit, either fresh, or in jams and preserves. The reason for the “Simple Complexity” in the title is the fact that this sauce is ridiculously easy to make, yet the number of potential combinations is virtually infinite. The complex layers of flavors that can be achieved by mixing and matching different fruits and vinegars is what makes this such a fun sauce to make and serve. You could use the exact same technique you’ll see in the video and make a new version every time you serve this for the rest of your life. 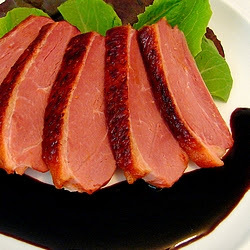 By the way, if you have any smoked duck breast laying around, the combination of Black Currant preserves and aged Balsamic vinegar I used was perfect. Enjoy! how you doing chef john? that looks really good, um.., i was wondering what kinda greens would you use with this? i was thinking orange and arugula but the sauce is already tart - it wont give a good balance would it? Can you puree the gastrique instead of straining it? I served it with baby romaine. the idea of a gastrique is that it has a balance between tart and sweet, so almost any green will work. Arugula would be great. Dan, As far as pureeing. That would make the sauce "cloudy" and it wouldnt have that beautiful clear shine I like. I burned my first test DVD today!! I think my cooking school may end up on a DVD vs. webpages. Still experimenting...stay tuned. BTW no plans on stopping the site. lets try lemon juice as the acid and orange marmalade as the fruit,with some fresh cilantro at the end. Should work! may fight the ginger in the 5-spice. You want a contrast, especially with the smokiness of the grill flavor. But, hey, give it a try if you want. You can make multiple versions since its served on the side. ...so this is what i did. 1. Fish, five spice rub (made it without ginger based on what you said in your video), seared on pan and finished in the oven. Served with..
2. Gastrique made with orange ginger marmalade, lime juice and cilantro. ....90% of the above I learned to make from your blog and loved every morsel of it! sounds amazing! Great job... You made me hungry! The smoked duck in the photo looks amazing -- much meatier than what I've purchased in the past. Where did you buy it? Hi! Just stumbled on your blog and I love it already. You do great work. Thanks! Hope you never stop. I'm an avid fan of your blog. Keep up the good work. Can the gastrique be done a little bit ahead of time? (before the chaos when everybody arrives. I want to drink the wines too!). Can it be eventually reheated? Also, if possible, what's YOUR tip for seared (fat-in) duck breasts? I'm looking at rendering the fat at low heat for about 10 minutes (starting with a cold pan and slightly scoring the fat), then about 2-3 minutes flesh down and finally 5 minutes in the oven at 300F. yes, the sauce can be made weeks ahead. I just score the skin and cook skin side down most of the way and then turn for a few minutes. I dont roast breasts. Thank you, Chef. They came out well, although a bit undercooked for 2 people. The gastrique was a very fine touch too. Butternut squash puree with a pinch of ginger powder was a nice side dish. I need to cook duck more often as its delicate flavor goes well with some of the more restraint wines I enjoy. Would you consider making a video on how to make smoked duck breast?